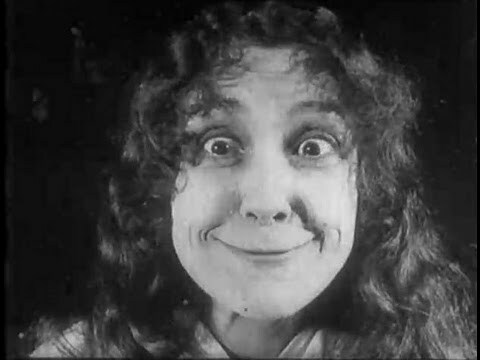 This is a truly unusual British short from a female director and star, Florence Turner (who was in a silent version of “Macbeth” in 1908 and would do “Far from the Madding Crowd” in 1915). It is essentially a situational comedy, but one which wisely plays on visual themes and the actors’ bodies rather than complex interpersonal relations for its humor. Turner plays Daisy Doodad, a young married woman who apparently has theatrical aspirations. One day, she shows her husband (Lawrence Trimble, also in “Madding Crowd” and also “Fools Gold”) an ad for a “face-making contest” at the local actors’ club – apparently “dial” is a slang term for “face.” But, on the day of the contest, she stays home with a toothache and her husband wins the prize. She jealously plots to enter the next contest, and rehearses on the public train into town. She causes an uproar among the passengers and passers-by on the street, and is arrested for “disturbing the peace.” When her husband comes to bail her out, she accuses him of paying the police to frame her. He sleeps alone on the armchair that night, and she dreams of her own contorted features. Turner’s performance reminded me of both Gilda Radner and Lucille Ball, the latter especially during her crying jag at the police station. Run Time: 8 Min 55 sec.